Noah Webster (1758-1843) was more than just America’s greatest lexicographer. He was also a Founding Father who helped define American culture. In 1783, he published the first edition of his legendary spelling book, which would teach five generations of Americans how to read. 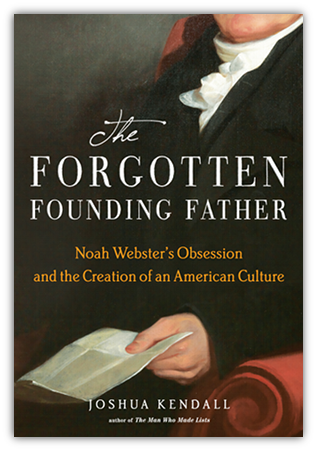 A leading Federalist, who was a confidant of both George Washington and Alexander Hamilton, Webster was in Philadelphia during the Consitutional Convention where he wrote a highly influential essay on behalf of the nation’s founding document. During the greater part of the 1790s, he edited American Minerva, New York City’s first daily newspaper. A dedicated public servant, he served as a state rep in both Connecticut and Massachusetts. “America’s pedagogue” was also a founder of Amherst College – he was an early president of the college’s Board of Trustees. In 1798, the 1778 Yale grad moved back to New Haven with his family — he and his wife Rebecca Greenleaf would raise seven children — to begin his dictionary. Having made a fortune from his publishing ventures, Webster could afford to follow his heart. The first edition of his American Dictionary of the English Language was published in 1828. He would continue working on revisions until the day he died. In contrast to his predecessor, the renowned British wordsmith, Samuel Johnson, who famously opined, “No man but a blockhead ever wrote, except for money,” Webster loved compiling and defining words more than just about anything else. This obsession, which was instrumental in helping a high-strung genius live an amazingly vibrant life, ended up giving America a language of its own. The biography was published by G.P. Putnam’s Sons, a member of Penguin Group (USA), on April 14, 2011 (on this date in 1828, Noah Webster copyrighted the first edition of his American Dictionary). “Everyone knows Webster’s dictionary, but how many know Webster? Copyright © 2019 The Forgotten Founding Father.